These nostalgic doughnuts are sure to get you in the spirit of the holiday. Hey there "Sugar Pie," if you're looking to find "True Love," then "I Got U Babe." We may not see our favorite sugary heart candies on shelves this year since manufacturer Necco shut down because of financial hardship, but that doesn't mean we can't enjoy the nostalgia of the sweet sayings we used to give to our grade school crushes. 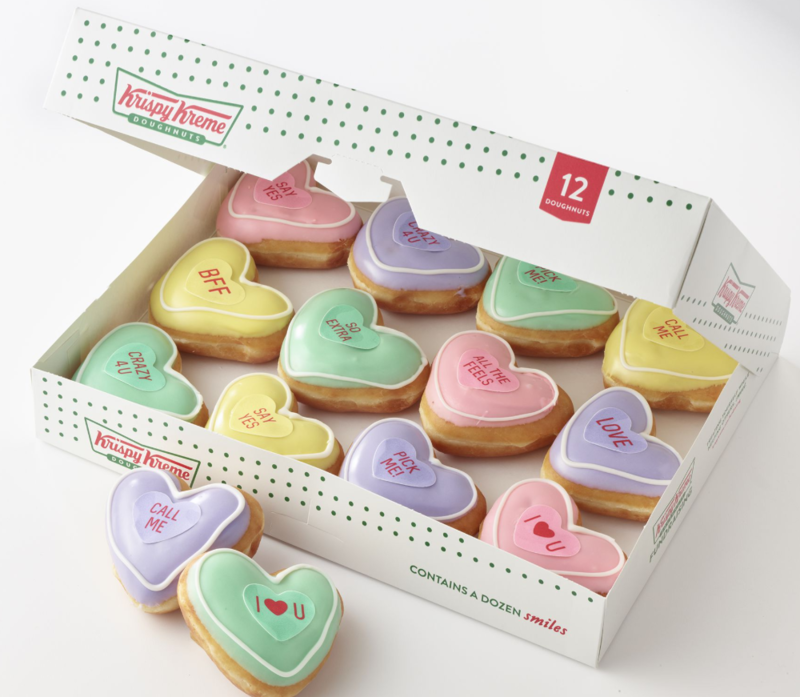 Krispy Kreme just announced that they're launching cute-enough-to-eat conversation heart doughnuts, essentially saving Valentine's Day, in my opinion. There's nothing like biting into a delicious Krispy Kreme doughnut, which is why this tasty Valentine's Day-themed treat is giving the traditional Sweetheart a run for its money. Sweethearts were cute and fun, but you may recall that the texture left something to be desired, and the flavor was lacking as well. Enter the Krispy Kreme Conversation Heart Doughnut. Available for a limited time only, these treats will be filled with four classic Krispy Kreme flavors: Cake Batter, Raspberry, Strawberries and Creme, and Chocolate. Is your mouth watering yet? These heart-shaped doughnuts will feature a variety of sayings, from classic sweet nothings to modern millennial speech: Think "Love," "Be Mine," and "Pick Me!" along with new sayings like "So Extra" and "All the Feels." We suggest buying a whole box so you can say it all. You'll want to act soon because these tasty treats will only be available for a couple of weeks. You'll be able to order them in Krispy Kreme stores starting January 30, and you can keep going back for more until Valentine's Day. But we have even better news: You can get a free conversation heart doughnut on February 6 with any purchase you make that Wednesday. You'll just need to create a rewards member account before then. Go ahead. You deserve it, "Honey Bun." As for the traditional candy hearts, we may see those make a comeback by 2020. What are your favorite Sweetheart sayings? How will you be celebrating Valentine's Day? Let us know in the comments.